Book Review - Card. Paper. Ribbon. I'm happy to have been given the opportunity to review Kristin Roach's brand new eBook, Card. Paper. Ribbon. Its concept is something quite special, in large part due to Kristin's personal philosophy... "I am driven to create, but not to create more waste." 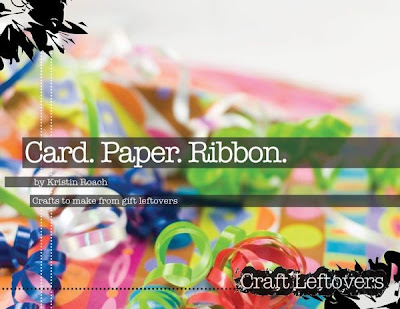 Kudos to Kristin, of Craft Leftovers [edit: site no longer available], for practicing what she preaches. She's invented uses for items that the rest of the population wouldn't bat an eye at throwing away... old greeting cards, crinkled wrapping paper, and used curling ribbon. 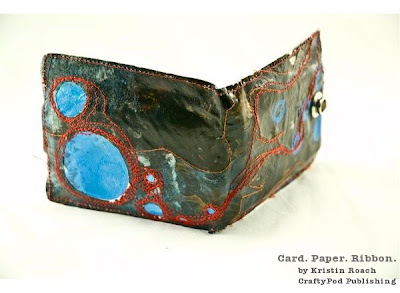 I've never made paper, but the idea has always intrigued me... Kristin takes us step-by-step through the process. 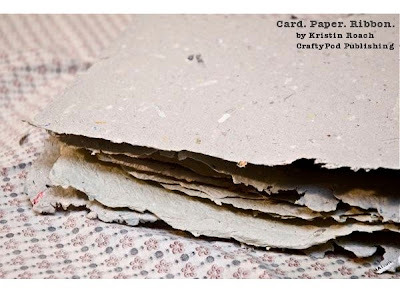 I was amazed to learn that just a couple of dozen shredded greeting cards and water are all it takes to produce a stack of rustic sheets. And once the paper is finished, Kristin demonstrates stab-stitch bookbinding to compile the sheets into a handsome journal. 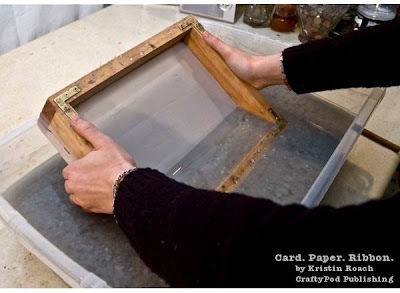 Now that I have a guide that begins at square one - how to build the essential screened frame, I'm much more inclined to give papermaking a try... next summer, outside... when I can splash and drip to my heart's content! Same goes for fusing rumpled gift wrap to cloth with a glue/water mixture - it looks like good, messy fun and produces a surprisingly strong material, perfect for creating bohemian, appliqued wallets and purses. Another nifty idea is to use yards and yards of ubiquitous, ribbed curling ribbon to lend strength to yarn. 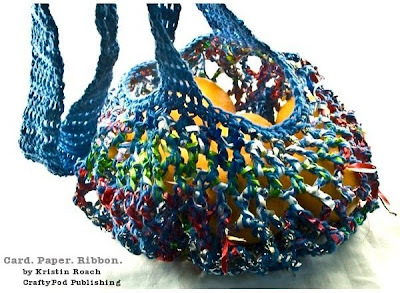 Kristin crochets and knits with it to make a sturdy grocery sack and storage basket. Since several of the projects feature crocheting, knitting, and use of a sewing machine, this book might best suit the general crafter. That said, there's plenty for the paper lover as well. If you're interested in tackling new subjects, Kristin has included an impressive list of online resources and personally recommended books, in addition to her own diagrams and step-by-step photographs. All in all, an immense amount of information at an affordable cost. 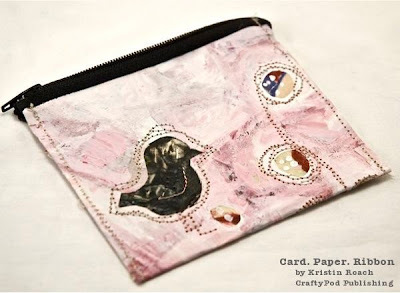 Kristin and Diane Gilleland, of Craftypod Publishing, teamed up to produce Card. Paper. Ribbon. I will say that learning new skills from a hefty PDF file requires a good bit of scrolling... it helps to read through all of the information first and then print out the handy, condensed version of each project to refer to as needed. Your posts are always so interesting..thank you for sharing. Thanks Priscilla, that's so nice of you.